(CNN) - David Turpin, administrator and principal of a Southern California private school operated out of his home, gave it an inviting name: Sandcastle Day School. The engineer started the school by simply filling out a Department of Education affidavit stating that his children were attending full-time. No more was required in California, and the state has no authority to monitor or inspect the school. 13 siblings held captive -- how did no one else know? 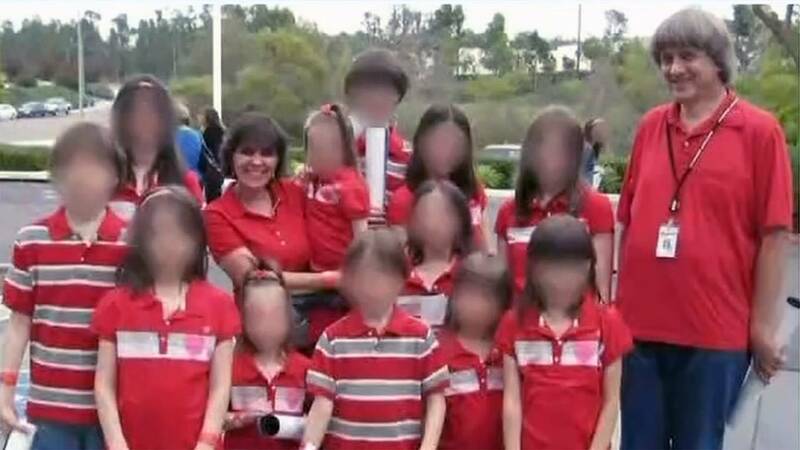 Turpin, 56, and his wife Louise, 49, were accused this week of holding their children captive in filthy conditions in their Perris home in Riverside County. They face charges of torture and child endangerment; bail was set at $9 million. It was not immediately clear whether they have an attorney. At least three siblings were shackled to beds with chains and padlocks in foul-smelling quarters, investigators say. The 13 siblings range in age from 2 to 29. The horrific conditions highlight what some experts say are lenient home-schooling regulations in many states. "The thing in all of this is -- it's up to the parents," said Rachel Coleman, executive director of the Massachusetts-based Coalition for Responsible Home Education. "Home schooling doesn't give any freedom to the kids. It gives all the freedom to the parents. In the hands of good parents, the kids can benefit and thrive. But in the hands of parents like the Turpins, it can be the complete opposite." On Sunday, one of their daughters, a 17-year-old, escaped from home by climbing out of a window. She called 911 from a deactivated cell phone she found in the house, authorities said. The daughter told deputies her parents were holding her siblings captive in the home, the Riverside County Sheriff's Department said. Riverside County Sheriff's Capt. Greg Fellows, who likened the siblings' treatment to torture, said their mother was "perplexed as to why" authorities came to her home. The California Department of Education does not have the authority to monitor or inspect private schools, according to a statement from spokesman Scott Roark. "We are sickened by this tragedy and relieved the children are now safe and authorities are investigating," the statement said. "Full-time private schools are required to register with the state to record their students' exemption from compulsory attendance at public schools." California is one of 15 states requiring that parents merely register with education authorities, according to the home education coalition, which has pushed for greater oversight. Others include Nevada, New Mexico and Wisconsin. Eleven other states, including Illinois, New Jersey and Connecticut, require no documentation. "There is no list anywhere of who's being home schooled in those states," said Coleman, who, like most of the staff and board of the coalition, was home schooled. "Parents aren't required to have any contact with education officials at all. There's no follow up. They're completely off the radar." Coleman said various states -- including Pennsylvania, Ohio, Michigan and Kentucky -- have proposed legislation in the last five years calling for greater oversight -- ranging from criminal background checks for parents to mandatory contacts with certified teachers and doctors. "None of these bills have passed," she said. "But an increasing number are being introduced with a regularity, that is encouraging." In the Turpin case, it's unclear whether a background check would have helped. Neither law enforcement nor child protective services had been called to the home in the past, officials said. Riverside County Department of Public Social Services Director Susan von Zabern said the incident "was the first opportunity we had to intervene." "What's making home schooling look bad is cases like this," Coleman said. "And the absolute way to improve the image of schooling would be to create laws to prevent these things from happening." Coleman said the coalition has recommended that states require home schooled children to meet with "mandatory reporters" such a doctors and certified teachers. The nonprofit has also advocated routine checks for criminal records and cases involving child protective services. "The thing about home schooling is you have some really extreme haves and have nots," she said. "Some home schooling families do more than an excellent job. Their kids are taking college classes in high school, innovative curriculum and getting to travel." And then there are cases like Sandcastle Day School. The organization has cataloged nearly 400 cases, most since 2000, involving severe to fatal abuse of what it calls "homeschooling's invisible children," Coleman said. "There are kids out there right now -- I guarantee you -- who are currently chained to their beds," she said. "I can say that because these cases keep coming up." But Scott Woodruff, senior counsel with the Home School Legal Defense Association, said home schooling is not a risk factor for child abuse. A higher level of regulation would not help children, he added. "The Turpin situation is obviously a horrible situation," he said. "Everybody should be appalled. But being appalled and being horrified, while they're absolutely necessary as a way of socially condemning what happened ... they aren't a good foundation for long-term policy." CORRECTION: This story has been updated to correct the age of David Turpin. He is 56.